Making things out of starstuff! Hi, there! We’ve finished studying the early farmers and Old Kingdom Egypt. For both we made barley. It turns out my rice cooker that’s terrible for rice does a great job with barley if you set it on brown rice. We also made and played Snake. Normally it’s made on a slab of clay with pebbles or little figures of gods and goddesses for pieces, but this one is printable and colorable. Click the picture below or this link to go to Flickr and download it. I included some animal hieroglyphs to use as pieces if you want, but we used Monopoly pieces. 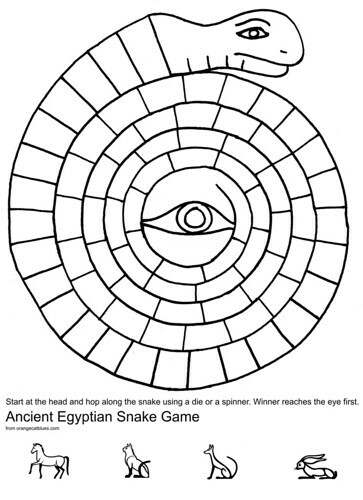 You can use a die, a spinner or trivia/flash cards to run along the snake’s body from the mouth to the eye. Or you can color it to match Candyland and use those cards. It’s easy to get creative. We used the “Poster” setting in our printer properties to tile it on cardstock to make a bigger board. Lego Kits: the Best Math Tests Ever! After reading me all the numbers on a measuring tape this morning, we decided to build the Samurai X Lego kit (400+ pieces). You can use any Lego kit. We used this one because Sagan’s favorite Ninjago character is Nya. (She built her own exosuit.) Also because it was marked down from $35 to $20, heh. The Lego Kit booklets require and reinforce the number line and sequential tasks. I had him read the number for each step before beginning. He put together the minifigs and their accessories himself first. After sorting the pieces by color and/or size in a sectioned tray (an egg carton would work), I demonstrated the first few pages of the next steps while he counted them for me. Here he told me it was step 15, and I asked him to look for gray squares with spheres and beige trapezoids. He put the bigger pieces together and I did the smaller ones. Here we needed a red rectangle with two holes. I had him read “2x” and explained it meant “two pieces”. From this point on he also started saying how many pieces we needed and pulled them all out before putting them together. but here he learned “right angle” as it applies to manipulatives, and decided himself that the other piece looked like a red sled. So we practiced shapes, colors, angles, attribute classification, number lines, counting, teamwork and sequential tasks today. But he thinks we spent the day playing Lego. Share book reviews and ratings with Sagan, and even join a book club on Goodreads. Kid's review: "Those animals are mean!" He didn't finish it. Kid's Review: "Those caterpillars sleep like Laz Kitty." Asked for multiple readings. Kid's Review: "Poor cat! That Mouse is a Bad Guy!" Requested multiple readings, then read it to himself.